Signed in lower right corner: S. Ivy, not dated. This adroit landscape, as fresh as it is thoughtfully composed, combined with a title that sounds like a program make us think of the early Blaue Reiter, when Vassili Kandinsky and Alexei von Jawlensky forged the traditional landscape into a spiritual meditation. The simplification of forms, leaving just a few essentials, the priority of color, the abandoning of realistic representation, show that Ivy has understood the rules of the New System. 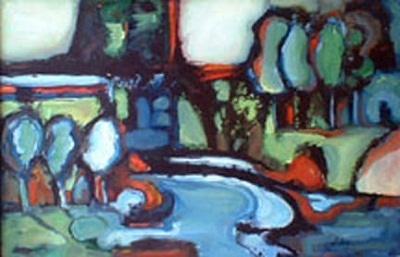 Some twenty years ago the painting was reproduced (in black and white) on the invitation card of the summer show of the Woods Gallery (now Museum of Art): Selections from the Permanent Collection, May 16 – August 12, 1988. There one can read the official title, so much more telling than Landscape. Two questions remain: who was Sara Ivy? And what happened to the three other reproduced pieces featured on the postcard?